S.O.D.A. (Serve Our Dog Areas) is a 100% volunteer organization founded by, directed by and supported by dog park users Just Like You! We are a non-profit organization formed to provide ongoing support and stewardship for the off-leash dog exercising area at King County’s Marymoor Park in Redmond, Washington. When S.O.D.A. “saved” Marymoor Dog Park and became a 501(c)(3) non-profit organization in 1995, we told King County that if they allowed us to keep our Dog Park that the people who used and loved it, would be willing to take on the responsibility for stewarding, maintaining and improving the beautiful 40 acres entrusted to our care. 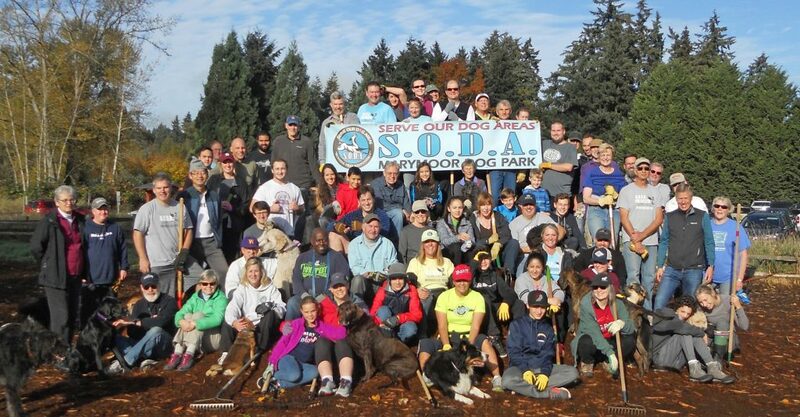 Since 1995, the support of the people who use Marymoor Dog Park has enabled S.O.D.A. to transform Marymoor Off-Leash Recreation Area into one of the BEST Dog Parks in the USA! Today we have three important missions: *Stewarding Marymoor Dog Park. *Promoting responsible Dog Ownership. *Supporting Off-Leash Dog Recreation. S.O.D.A. needs your $upport! Please help us keep off-leash fun and activity at Marymoor by joining S.O.D.A.! S.O.D.A.’s “2019 Annual Parking Pass Fundraiser” is Over! S.O.D.A. HATS – VIEW THEM HERE!